Well, this was our 3rd year to take Avery to the Carmichael's Pumpkin Patch. Avery has been talking about going for months ever since she saw pictures from when she was a baby in my scrapbook back in the summer! So she was very ready to go! Our MOPS group planned a day out with the kids today so Avery got to see a few of her friends there. It wasn't too chilly which was good. 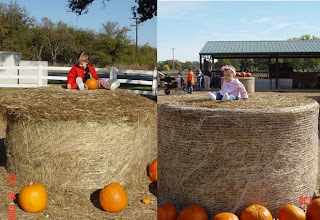 Avery had a pony ride, fed the goats, had a hay ride, and got to pick out a couple of pumpkins to take home! She had a great time and has been talking about it all day! Time flies way tooooo fast! I love the comparison pictures! You'll have to do that every year to see how much she's changing.